Whether you talk to your customers face-to-face, over the phone or in live support chat online, what you say and how you say it matters a lot to your business. Believe it or not, the right language is truly important in Customer Service. Certain words and phrases can either make or break the whole impression and the way a customer is left to feel after the conversation. It’s probably the golden words of customer service that can turn even an unhappy customer into a loyal brand advocate. I had to experience lots of situations when companies that failed to deliver on the promise went into excuses straight away instead of just admitting their fault and simply apologizing. Whenever something goes wrong, even if it’s due to circumstances that are beyond company’s control, ‘I am sorry’ is the very first thing a customer wants to hear. Always. Explanations, solutions and promises to make things better next time come second. “I appreciate your business” is even more powerful and a step above ‘Thank you’. Words of gratitude will make your customers feel appreciated for their loyalty to your brand. It might sound so obvious, but how often do you get thanked for being a customer, especially a loyal one? There’s never too much gratitude in customer service. That’s why we should take every opportunity to thank our customers for choosing us over the competition and for their trust. After all, there is no business without customers – and no successful business without loyal customers. Whenever people turn to customer service reps for help, they don’t know if they are actually dealing with a company CEO or with a customer service agent trainee. Every singe person a customer contacts with is the face of the company in the customer’s eyes. Your customers don’t care if you don’t know how to fix their problem or if you are not authorized to do it. It’s your job. They expect you to do whatever it takes to be done. If you really don’t know / can’t do it immediately, promise to find out how and just be that person who takes responsibility and someone a customer can rely on. Although being honest is absolutely necessary for building trust with customers, it would be better to admit that you don’t know / can’t do something in a positive language. I’m fully confident that a plain ‘No’ should be excluded from the customer service vocabulary once and for all. Being a ‘yes-person’ is a much smarter strategy in customer service. Even if you really have to say ‘No’ there are so many ways to say it without leaving your customer disappointed. When customers say ‘Thank you’ in most cases they hear ‘You’re welcome’ in response. While there’s definitely nothing wrong with these words, still it’s just a standard way to respond that doesn’t actually express any meaning and emotional significance. Instead, using ‘My pleasure’ would make that slight difference and let your customers feel more valuable. For a customer it would sound like ‘I was really glad to help you’ which is much more pleasant than just a meaningless cliché. This simple, yet powerful phrase conveys genuine care and your willingness to go the extra mile to make sure that your customer gets completely satisfied. Showing your immediate readiness to help before you even know if any other problem exists is a great way to end every customer interaction. Remind yourself regularly: a customer who leaves happy, satisfied and well-cared for is more likely to come back and spread the good word about your business far and wide. I’m sure there’s nothing new for customer service people in the listed phrases. Still, we sometimes let our emotions, ego or just old habits get in the way of choosing the right language when talking to our customers. 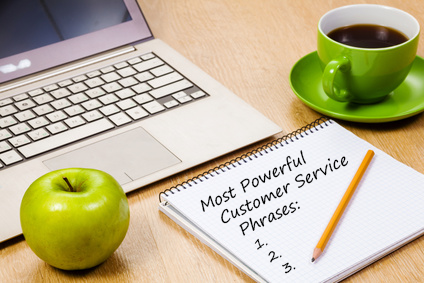 Which phrases do you consider the most important in customer service? Feel free to share them in the comments below. This entry was posted in Articles, Best Practice, Tips and Tricks and tagged customer care, customer service, customer service training, customer service vocabulary, customer support. Bookmark the permalink. Great examples, I like ‘would your dog like a biscuit?’. Gets me every time. That’s an awesome example, David, thanks! Great article, Mary. Being wise in what we say to customers is excellent customer care. These are magic words that people want to hear from us. Here are my favorite lines – “I appreciate your business” and “How can I help you?”. Very positive and proactive. Thanks John, I love them too and would like to hear them more often as a customer. Doug, thank you! Absolutely, feel free to quote. Greetings! Very helpful advice in this particular post! It’s the little changes that produce the most significant changes. Thanks a lot for sharing! Thank you Mary, a great blog. But it is not the phrase that counts it is the ‘can do’ attitude that makes the customer feel that you are serious in taking action and more importantly that you DO IT. Help and assist as best as you can, all in a timely manner (means asap.) My advise is: enjoy serving or leave it for someone who is enjoying it to make it a great experience for both sides.Thank you again for your blog. Thank you Detlef, you’re right, it’s not just about the phrase, it’s also about the right attitude. Words “thank you” and “we appreciate your business with us” are really magic for customers. But we have to really appreciate… customers feel it. These phrases must be in blood of every person working in customer service. If I may add one more, it would be ” I would be delighted to help”. I agree totally with your keywords and phrases. However, as you will appreciate; when using these, they have to be spoken with integrity. Guests or Clients will quickly see through those who use platitudes without any conviction. Thanks John, you’re right, it’s not just the phrases, they way you say them (and how you feel about saying them) is equally important. Yes Mary, you are right . These phrases are not important in Hospitality industry but any place of business where you want to let customer feel that we need them to come back. Thanks Arvind, that’s true, they are important in any business of any industry. The one undertaking I have experienced in being in business for myself is that I need my customers much more than they need me. Customer service is what keeps our businesses alive and the most important attribute in the hospitality industry. Thanks Bill, customer service is truly the core of any business, and not only in the hospitality industry. In my experience, the customers are the one running your business. Without your costumers, your business will fail. So right customer service is a is a must. You have to handle your customers with utmost care. 1 bad feedback from a customer will mean failure to your business. Hye Mary Shulzhenko, I am Student of marketing and Customer Service, well i am searching these thing for last 2 days, I think with the help of these little worlds, you can built a strong Customer relation and if you use these world, you retain old and news customers. Great examples of customer service phrases. One of my personal favorites is “Can I help you with anything else”. It gives a sense of care to the customers. i am a relation manager in bank and my favorites customer service phrase (how can i assist you).